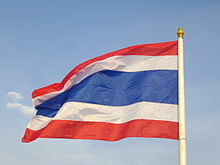 The flag of the Kingdom of Thailand (Thai: ธงไตรรงค์; RTGS: thong trai rong, meaning 'tricolour flag') shows five horizontal stripes in the colours red, white, blue, white and red, with the central blue stripe being twice as wide as each of the other four. The design was adopted on 28 September 1917, according to the royal decree issued by Rama VI that year. Since 2016, that day is a national day of importance in Thailand celebrating the nation's flag. The colours are said to stand for nation-religion-king, an unofficial motto of Thailand, red for the land and people, white for religions and blue for the monarchy, the last having been the auspicious colour of Rama VI. As the king declared war on Germany that July, some note the flag now bore the same colours as those of the UK, France, Russia and the United States. The Flag Act of BE 2522 (1979) stipulates the design of the national flag as "rectangular in shape with 6 part width and 9 part length, divided into five stripes throughout the length of the flag; with the middle stripe being 2 part wide, of deep blue colour, and the white stripes being 1 part wide next to each side of the deep blue stripes, and the red stripes being 1 part wide next to each side of the white stripes. The National Flag shall also be called the Tri-Rong flag". The first flag used for Siam was probably a plain red one, first used under King Narai (1656–1688). Naval flags later used different symbols on the red ground—a white chakra (the weapon of the Hindu god Vishnu, which is also used as the symbol of the House of Chakri), or a white elephant inside the chakra. In 1916 the flag was changed to show a white elephant in royal regalia. In 1917, the current design, but with the middle colour being the same red as the outer stripe, was defined as the civil ensign. The story goes that during a flood King Vajiravudh (Rama VI) saw the flag hanging upside-down, and to prevent this from happening again created a new flag which was symmetrical. Later in 1917, the middle colour was changed to dark blue, which was similar in tone to indigo, which at the time was regarded as the auspicious colour for Saturday, the day King Vajiravudh was born. According to other sources, the blue colour was also chosen to show solidarity with the Allies of World War I, which also had the colours blue-red-white in their flags. c. 1700 – c. 1790 National ensign during late Ayutthaya and Thonburi periods A red plain rectangular flag. c. 1790 – c. 1820 State and naval ensign decreed by King Phutthayotfa Chulalok (Rama I) Red flag with a white chakra, presumably to represent the Chakri Dynasty. c. 1820–1843 Change instituted by King Buddha Loetla Nabhalai (Rama II) Red flag with a white elephant inside the chakra. 1843–1893 National ensign decreed by King Mongkut (Rama IV) A white elephant, facing the hoist, centred on a red field. Called in Thai language "Thong Chang Puak (in thai: ธงช้างเผือก)" (elephant flag). 1917–present National flag, civil and state ensign Flag with horizontal blue stripe one-third wide between white stripes one-sixth wide, between red stripes one-sixth wide, known as the Trairanga. The naval ensign of the Royal Thai Navy (RTN) is the national flag with a red circle in the middle that reaches as far as the red stripes at the top and bottom. In the circle stands a white elephant, in full caparison, facing the hoist. The kingdom's naval jack is the national flag defaced with the emblem of the Royal Thai Navy in the middle. The regimental colours of the RTN is as same as this flag; both ensigns were adopted in 1917. Flag of India, which has a similar name "Tiranga"
^ (in Thai) การฉลองครบรอบ 100 ปี การประกาศใช้ธงไตรรงค์ เป็นธงชาติไทย Thailand.prd.go.th, Retrieved September 26, 2017. ^ "Thailand: A Country Study". Country Studies Program, formerly the Army Area Handbook Program, from the Library of Congress. Mongabay.com. Retrieved 23 July 2011. Sarit revived the motto "Nation-Religion-King" as a fighting political slogan for his regime, which he characterized as combining the paternalism of the ancient Thai state and the benevolent ideals of Buddhism. ^ Duncan Stearn (14–20 February 2003). "A Slice of Thai History: Raising the standard; Thailand's national flags". Pattaya Mail. Retrieved 24 July 2011. The prevailing – although unofficial – view of the meaning of the five stripes is that red represents the land and the people; the white is for Theravada Buddhism, the state religion and the central blue stripe symbolises the monarchy. It has also been stated that blue was the official colour of King Rama VI. Another account claims the blue was inserted as a show of solidarity following Thailand’s entry into the First World War (in July 1917) as an ally of Britain and France. ^ "An unofficial translation from the Office of the Council of State" (PDF). Krisdika.go.th. Retrieved 9 January 2018. ^ a b "มาตรฐานแถบสีธงชาติไทย" [Flag of Thailand] (in Thai). National Science and Technology Development Agency. 16 October 2017. Retrieved 16 February 2018. ^ "ประกาศสำนักนายกรัฐมนตรี เรื่อง รูปธงชาติตามพระราชบัญญัติธง พ.ศ. 2522" [Announcement of the Office of the Prime Minister regarding appearance of the National Flag in accordance with the Flag Act, B.E. 2522] (PDF). Royal Thai Government Gazette (in Thai). 164 (Special 245 D): 1–2. 4 October 2017. Retrieved 4 October 2017. This page was last edited on 22 April 2019, at 04:18 (UTC).